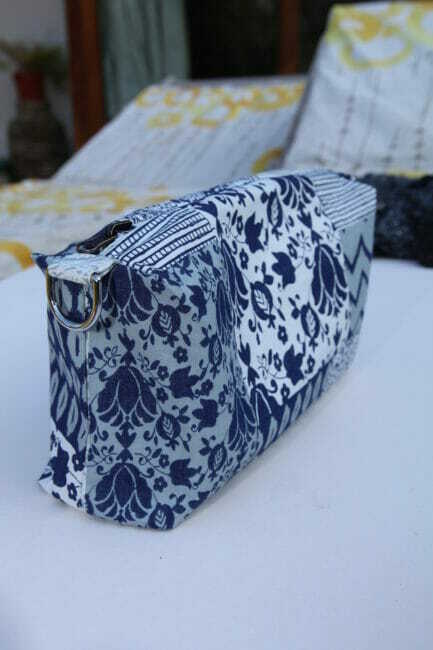 This week we are making a reversible crossbody handbag, plus a method of adding an extra pocket to it that works for the fabric and vinyl reversible tote bag as well (we made this a couple of weeks ago). 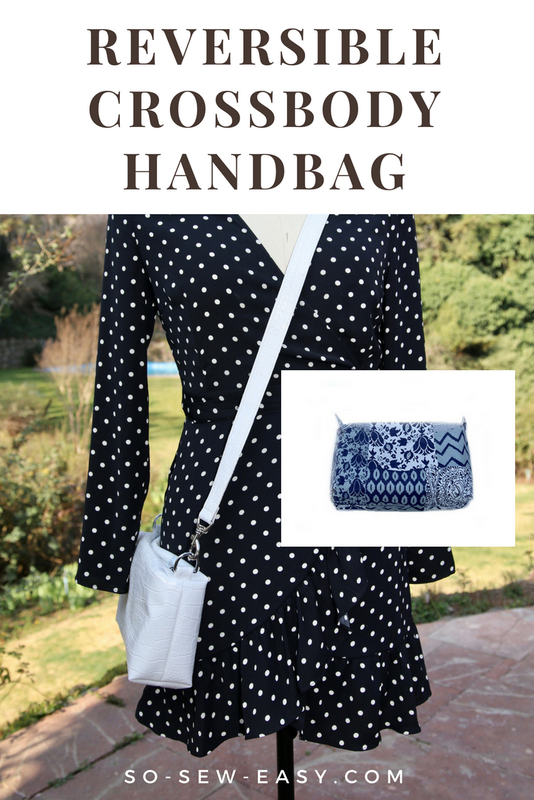 I am providing you with a basic pattern and you can come up with all the pretty details to set this reversible crossbody handbag apart from the rest. 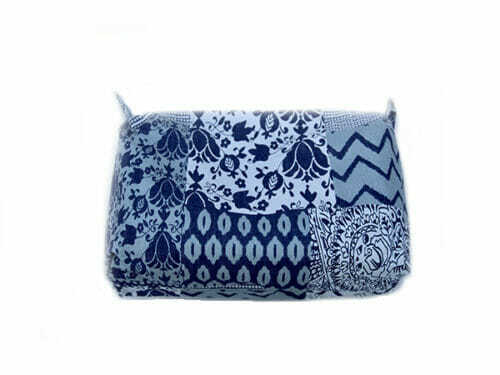 This handy handbag can also be used as a clutch bag as well. 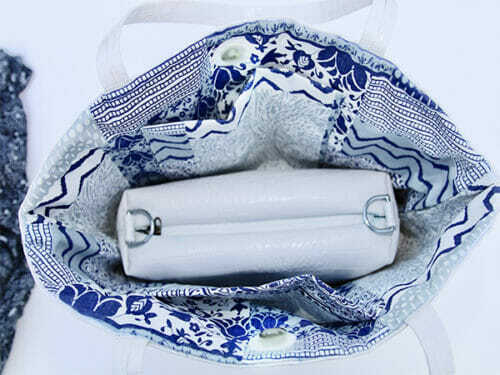 It can also be as extra pockets for those of you who wanted more room inside the reversible tote bag. An example of a crossbody handbag in two colors. You can download the pattern for Reversible Crossbody Handbag from our account at Craftsy. 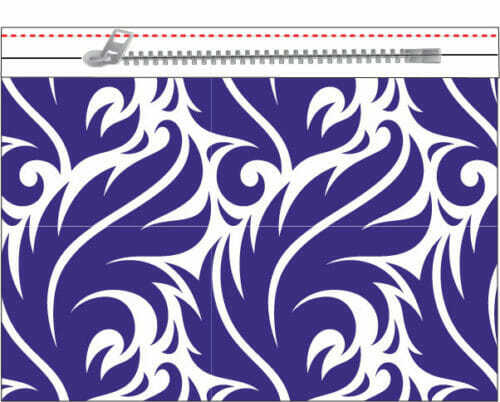 The key to this pattern is not so much the fabric but the use of a reversible zipper. I have linked you to the best source I could find online. This project is perfect for leather and vinyl that is already a medium to heavy weight and if you back it up with oilcloth you will eliminate the need for interfacing. But the limiting factor on this project will be the type zipper you can find, so I recommend to purchase the zipper first then match the material to it. All I could find in my neck of the woods is a zipper that can be purchased by the yard with additional heads. 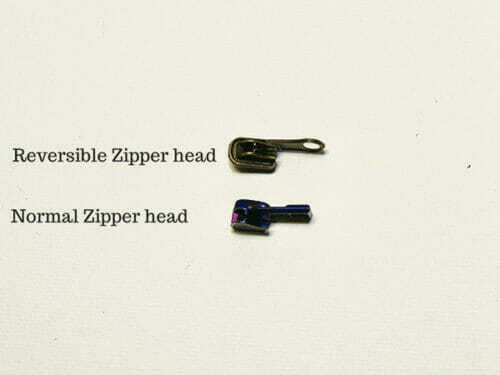 The head is what makes it reversible and it has a peculiar look, see it for your self and compare it to a normal zipper head. The zipper tape looks the same in the front as in the back. 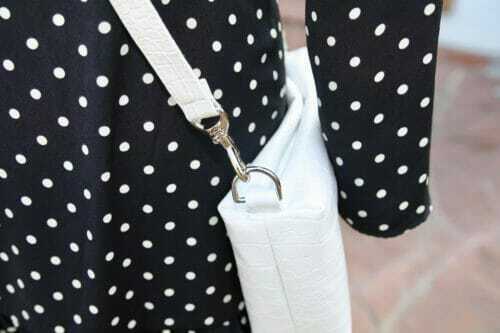 I want you to keep in mind that there are two ways to make this reversible crossbody bag. 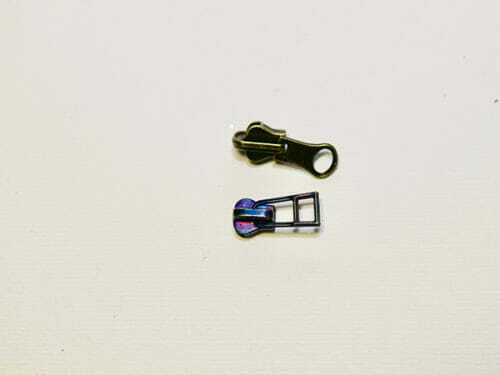 One is the drop in method (more difficult because of the zipper) and the other is done by leaving a gap and turning through the gap. The same as we did in the reversible tote bag project that we did a couple of weeks ago. 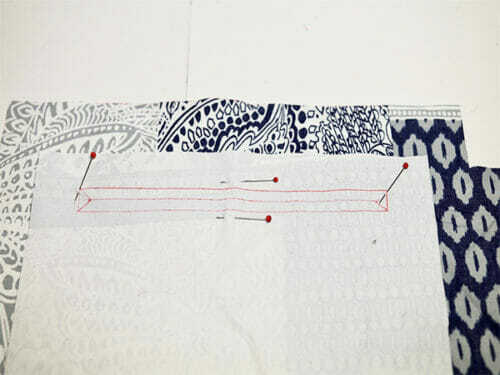 I am showing the easiest way that it can be done in a home sewing environment. But, you still have to add a finish. For better results and for those that would like to use better fabrics and materials the use of an industrial machine is ideal. As you progress with your skill as a bag maker you will realize more and more that investing in an industrial sewing machine is the way to go. It's something to think about if you can justify the expense. We will start by making the D-ring tabs and adding the pockets, then we will sew the zipper to one fabric then sew the zipper to the vinyl. 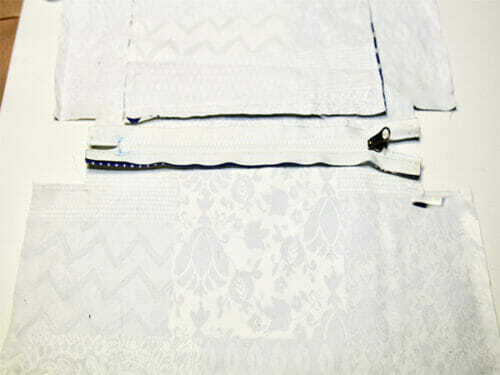 We will box the corners and add the D-ring with the tabs and close the gap we have left on the fabric. I have provided you with a strip divided into four pieces. 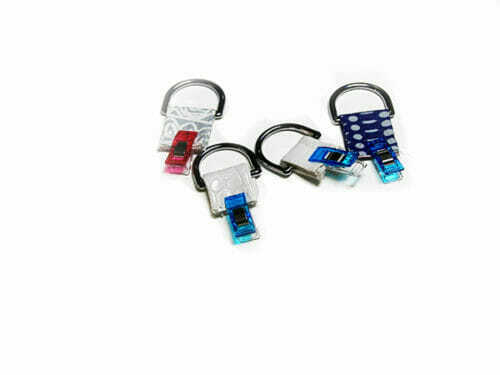 You will need 4 pieces of each material to make two D-rings on each material (fabric and vinyl). Sew at 1/4″ and turn right side out. Insert the D-rings and put side. 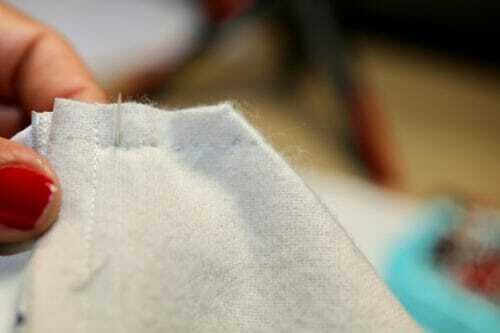 You will need this after you have placed the zipper and sewn the sides. On the picture below I am showing you only two tabs, so don't be confused as I forgot to take a photo of the other two tabs in the vinyl. But, here they are with the D-rings. This is an optional step but it is always nice to have a pocket in a bag. Even if it is only one. 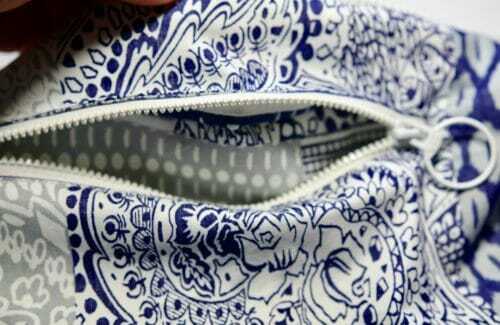 It is not difficult to add a zipper pocket to a bag, we have already shared the tutorial and there is a video to show you how to do it. 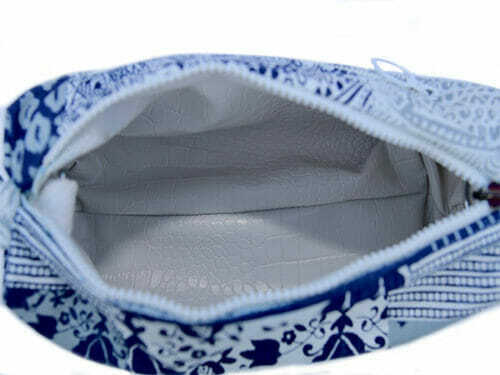 I have to add just a simple note here about pockets when you own a pocket the fabric inside will show. There are two ways to this, the tailoring method for an upscale look in your bag (follow the lining of the pocket instructions) and the ready wear or mass produced method. I will show you the mass produced method and it is as simple as laying the fabric print side up and the pocket print side down. 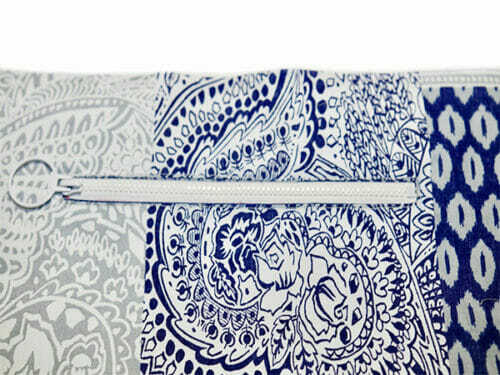 What happens is that when you open the pocket you will see the pretty print instead of the reverse of the fabric. Print side up and place the zipper head on the left-hand side, sew where the red line is in the picture. On the other side of the tape, sew the other side of the clutch. 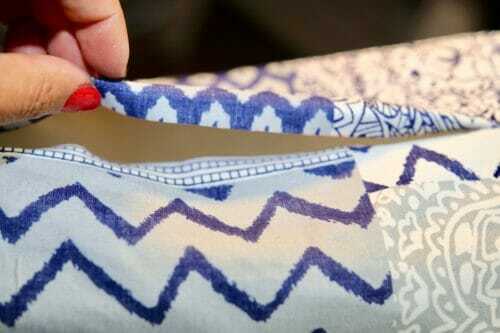 The print should face each other when you are sewing the zipper down. Turn the workprint side down. Place the vinyl or leather piece right side down on the top side of the zipper. Turn the side upside down and place the vinyl side on the other side of the zipper tape. Sew the left, right and bottom of the vinyl. Do the same for the fabric but instead at the bottom leave a gap of 6″. 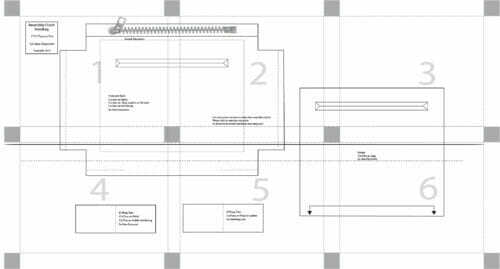 Join the sides and align the seam allowances so they run continuously making a straight line. Adding the tabs with the D-rings is what makes this bag a reversible crossbody handbag. The procedure is the same for both materials. Align the tab in the center of the seams. Sew the corner from the side to the center a couple of times. I am actually sewing by hand because my machine is not able to sew the layers. 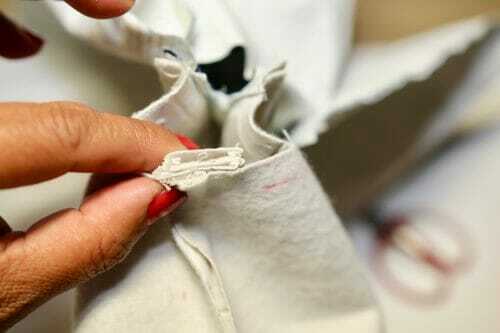 Push the bottom seam allowance to the side. 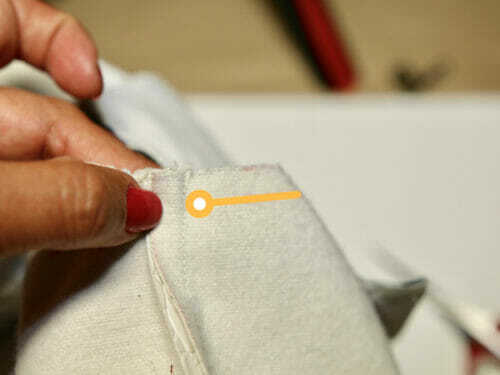 Push the top seam allowance to the left as well. 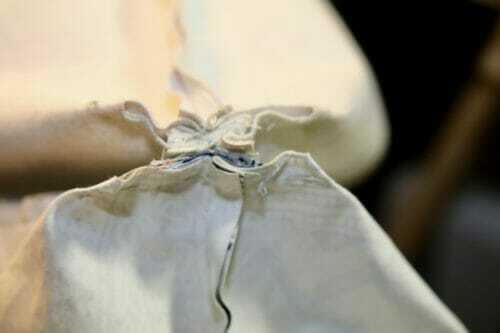 This is so the layers are not so thick and you can sew the corners with your sewing machine. Sew from the sides to the center a couple of times. I am sewing by hand three times using a running stitch. Sew the other side of the corner moving the seam allowances to the right. Here are the layers all together. 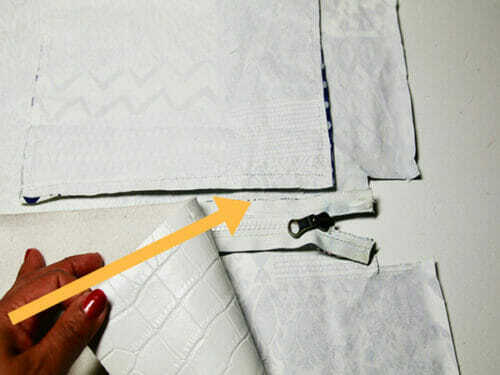 Turn the bag inside out and close the gap in the fabric. 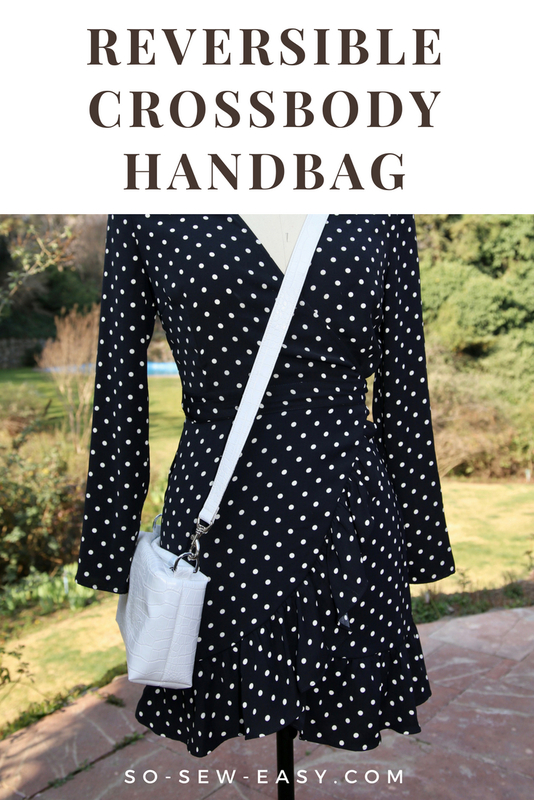 Hope you enjoyed this reversible crossbody handbag, it is actually a surprisingly easy project to do and would make a great Christmas present. 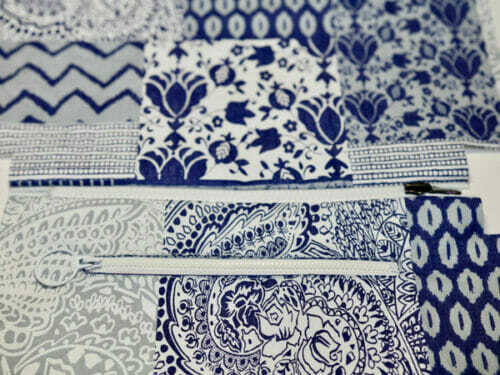 Until next time, when we will be making a skirt on the fabric of the season, a lovely jeans fabric. Happy sewing! I’m making this cute crossbody bag as a Christmas gift for my daughter-in-law! But wanted to mention that the link you posted for reversible zippers by the yard is actually NOT for a reversible zipper! I had to scramble to get one I could use at the last minute. I have changed the links, thanks you for letting me know. I don’t quite understand the directions for adding the inside pocket, is there a tutorial or a bit more instruction somewhere else? It’s a great bag, thank you for sharing it! Hi Christine, click on the link to go directly to the tutorial, there is avideo as well. I honestly don’t know how you do it! You provide great patterns AND detailed tutorials FOR FREE!!!! I’ve designed & sewn my own bags/purses since I was young (my mom taught me basics so I could make what I needed) and know when I came upon an issue, I’d just improvise…I don’t know if I could ever document those improvisations! I sincerely thank you for all your time, effort, friendly emails, and obviously, your great patterns! I do what I do for two reasons, I love to take a piece of fabric and transforme it into something new and I love to share what I have learned with you. Advertizing pays enough for me to keep on going so why charge for it? 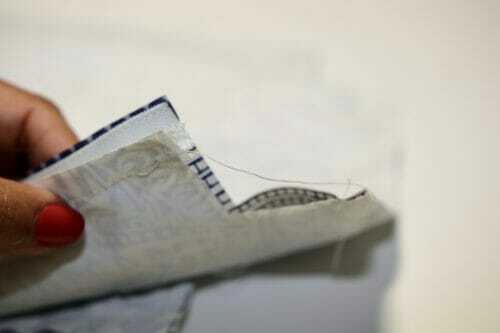 Then you send a mesages and i feel even we are worlds apart we are friends and share the bond of creating and sewing. It is a great life don’t you agree? This looks like an awesome bag that I will make. I agree with K. Hoffman that the dress in the picture is beautiful and I would love to know what pattern it is also. The bag looks great, but I would also like to know which pattern the dress is. Thanks. The dress is coming up for fall, hand in there as soon as I can test the larger sizes I will release it. What are the measurements of the finished bag? Did I miss reading that info somewhere? I did not add the measurements, I will latter thatnks for the reminder. I would like to thank you, encore et encore, for your generosity with your free tutorial and especially the pattern template. The picture tutorial is very explicit,it is very easy to follow. I really enjoy your site. I am so happy you enjoy this site and find inspiration here, thank you for your comment, it makes for a happy day XOXO. This looks great. What a fun addition to the reversible tote bag. I made that one and it did seem to need a few more pockets. With this addition, it will be much better. Yes Joan, I think there is not such thing as too many pockets, is there?